On a Friday lunchtimes at Fulford there’s a fabulous bunch of y8 girls who come along to learn, design, create electronics projects for a STEM competition. Recently we’ve been learning how resistors work so we can choose the right ones for an air quality sensor project. To help the girls learn, and to hopefully generate some money for resources for the club, I’ve made a Resistor Values app for android phones and tablets. 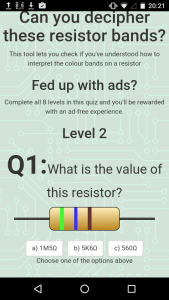 There’s loads of resistor values apps out there already but this one adds a test yourself self marking quiz game to the usual features that teach you what the different colour bands mean and let you check what values are available closest to the resistance you need for your project. The app is free to download and use but anyone who clicks on the adverts in the app will be raising a tiny amount to support girls STEM club. Anyone who completes the quiz will then be rewarded with an ad free version of the app. If you’ve got an android phone or tablet you can download the resistor values app here. If not, you can try out the app in your mobile or desktop browser here. Any feedback or suggestions gratefully received-try out the app and leave a review. 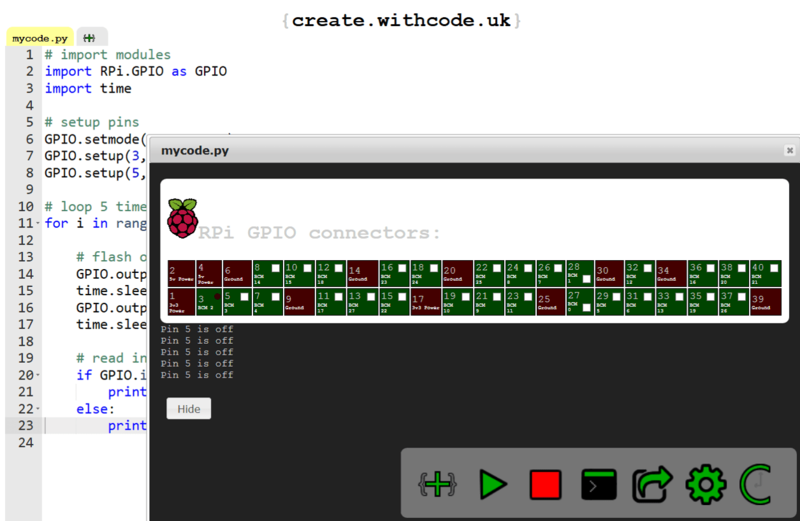 Following on from the micro:bit python simulator on create.withcode.uk, many students and staff have requested a python simulator for the Raspberry Pi GPIO pins. This quickstart guide talks you through how to start writing code for physical computing using the GPIO pins on a Raspberry Pi. It’s designed for teaching students how to do physical computing without having to invest in a separate Raspberry Pi for each student. You can write, run, debug and share code that simulates the GPIO pins reading inputs and controlling outputs in a web browser then just have one (or more) Raspberry Pis set up with LEDs and switches connected up to demonstrate the same code. This speeds up development time and reduces set up time and costs. Physical computing is much more fun when students can actually see their code controlling a real life device – so this isn’t designed to replace actually plugging in and connecting up the physical components. This simulator is designed to supplement and complement the actual physical computing: to iron out the more frustrating parts of the development process so students can focus on tinkering with the code, debugging, sharing, collaborating and exploring.